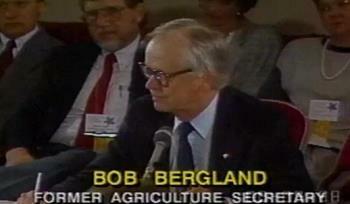 Robert Bergland born in 1928 to a farm family in Minnesota was involved in U.S. agriculture for his entire career. His first national exposure was representing the Congressional 7th District of Minnesota from 1970 until 1977. He was appointed Secretary of Agriculture by President Jimmy Carter implementing beneficial programs for the four-year term. Subsequent to his tenure at the Department of Agriculture, Bergland served as president of the Farmland-Eaton World Trade and in 1984 he was appointed as the CEO of the National Rural Electric Cooperative Association. He was buried in his hometown of Roseau, MN.